On Monday, November 27th, Amazon announced the preview of a new cloud-based AR / VR content creation / hosting platform called Amazon Sumerian, which is being pitched as a way to build 3D-powered applications to run on a range of hardware environments including high-end VR headsets, as well mobile products like the iPhone or iPad. It supports WebGL 2 and WebVR, and Amazon plans to make its tools compatible with Google’s AR software tools for Android-powered devices soon. ARKit is supported for AR development, with support for ARCore also promised. 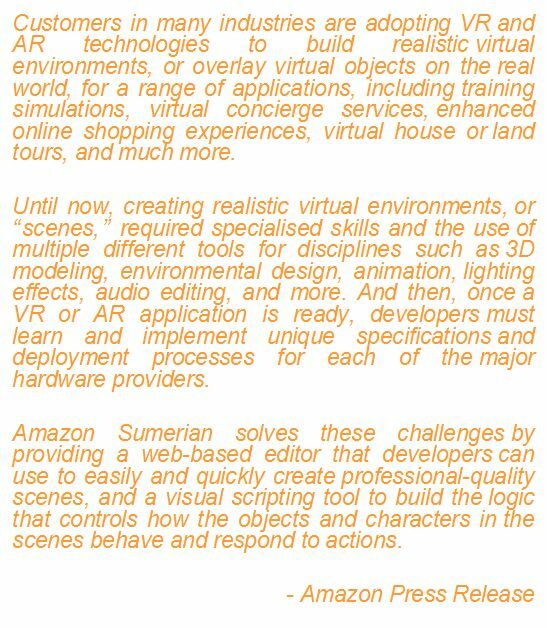 In essence, Sumerian is geared towards those companies that are using gaming engines like Unity and Unreal to build virtual reality apps for corporate training, product development, employee education, etc., with them aim of providing them with a platform that can achieve the same while avoiding the overheads of requiring specific Unity / Unreal in-house skills or having to manage the systems require for such environments internally. In addition, Amazon see the platform as providing a means for businesses to provide things like concierge services, virtual house or land tours, and enhanced on-line shopping experiences. Like Sansar, Sumerian uses one cloud-based environment in which to publish scenes (the Host), where users can access it, and a separate building / editing environment for actually constructing scenes. 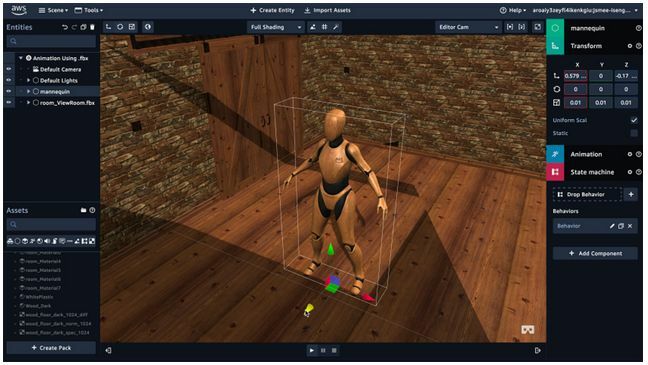 It also has an asset management system that allows customers to upload 3D objects in .FBX and .OBJ format, either as original content or from third-party sites such as TurboSquid (Sumerian also supports import from SketchFab), and which includes a library of pre-built Sumerian objects and scenes. It’s not entirely clear how users interact with Sumerian scenes; no mention is made of avatars being used – and they probaly wouldn’t even be needed for AR environments. However, there is a concept of scene “hosts”, which should not be confused with avatars. Hosts are AI-drive characters capable of guiding users through scenes, respond to spoken-word questions, narrating a prepared script, use multiple languages, can be integrated with Amazon Lex and Amazon Polly, and so on. For the preview period, use of Sumerian is free. there is no charge to design and edit your augmented reality (AR) and virtual reality (VR) applications. There will be no upfront costs or minimum fees for customers, instead charges are based on the amount of storage used for the 3D assets stored in Sumerian, and the volume of traffic generated by a scene, and for the use of any other AWS services, like Amazon Lex and Amazon Polly, used by a Sumerian Host. Those with Amazon AWS Free Tier, get access to Sumerian and can create a 50MB published scene that receives 100 views per month for free, for the first 12 months. Again, in difference to those making Sumerian / Sansar / High Fidelity comparisons, Sumerian is less about making game-style or social environments, and far more about making the VR / AR application creation and hosting process a lot easier for companies that don’t necessarily have the expertise and resources of a dedicated software developer. They can whip up a training space or a VR shopping helper without having to worry about code. Of course, Sansar has also been promoted as an environment which could be used for training, simulation, education, and possibly other business uses; but it is not unfair to say that right now, it needs to mature somewhat before it is likely to be widely accepted in these environments. As such, it’ll be interesting to see how Sumerian fairs, and whether it might influence Linden Lab’s thinking around Sansar, perhaps pushing them even further towards the more social / games-led opportunities Sansar could encompass. In the meantime, those wishing to take a closer look at Sumerian – and bearing in mind this does seem to be geared towards business use – can try the preview sign-up.